or: Hughes for this generation. One word to sum it up: Smart. 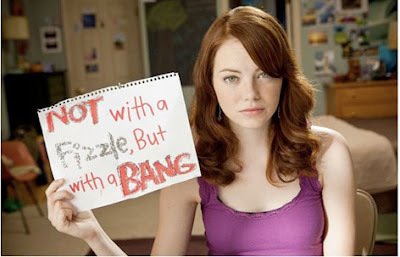 I have been looking forward to seeing Easy A ever since I first heard about it. Not only did it look like a choice teen comedy, which have been surprisingly lacking lately, but this was an ample opportunity to let Emma Stone's star shine. For so long she has been the best thing about really crap movies. Did no one ever think to give her a lead role in a movie until now? Well at least the tables have turned for her...now she can say that she was the best thing of an equally good movie. High school student Olive Penderghast (Emma Stone) finds herself the victim of her school's 'rumour mill' when she lies to her best friend Rhiannon (Alyson Michalka) about a weekend tryst with a fictional college freshman. Word quickly spreads of Olive's promiscuity and, much to her surprise, she welcomes the attention. When she agrees to help out a bullied friend by pretending to sleep with him, her image rapidly degrades to a more lascivious state and her world begins to spin out of control. As she helps more and more of her classmates and her lies continue to escalate, Olive must find a way to save face before the school's religious fanatic Marianne (Amanda Bynes) gets her expelled and she loses a shot at attaining her own happiness. I'll start by saying this: Emma Stone is amazing. She is a young actress who can take a character and give it all the charisma, charm and vivaciousness it needs to come to life. Boy, is her special talent recognized in Easy A. She easily makes this movie as great as it is, with her sarcastic sense of humour. A lesser actress may have stumbled with the ultra smart script filled with big words last seen in The Social Network, but Stone makes it all believable and utterly addictive that Easy A is, well, addictive. The rest of it's cast is pretty good, apart from Amanda Bynes, who was supposedly retiring from acting. We haven't seen her for a while, but she hasn't changed in her time away from the film. And it's hard to see her still as a teenager. She is kinda annoying in this film, but I think that is all down to her character. Patricia Clarkson and Stanley Tucci are undoubtedly the stand outs as Olive's rather open parents. They managed to get the most laughs because the audience have all had their parents embarass them at least once in their lives, but these two are just plain embarassing it's funny. There hasn't been a good teen comedy since Mean Girls, and Easy A realizes that and tries to breathe life into the often under done genre. While the script isn't as smart as Tina Fey's 2004 one, it is generally a lot funnier than those raunchy college comedies that we find on the DVD shelves. The best thing is that this script is true. Everything could happen in real life. The rumour mill is there to be played with, which is what Easy A does. Of course, this movie owes a lot to the 80's comedies, but in all fairness, it's about time this generation saw some John Hughes style comedy. Easy A captures all the humour of growing up, and it can easily be compared to some of those John Hughes classics. The fact that it has so many references to his film is so cool, because now some of those younger folk may want to pick those movies up and give them a watch. So all I'm left to say is: thank you, Easy A, for reminding our generation that a teen comedy can be smart, not be too raunchy, and be all out funny while being heart breakingly true. THE VERDICT: A great showcase for Emma Stone, and a fantastically written comedy with all the smarts of an 80's comedy. Must see for any teen. Since Mean Girls, there was only She's The Man, and now Easy A. I actually liked Amanda Bynes' role because it was so different from what she usually does. I LOVE EMMA STONE, PATRICIA CLARKSON AND STANLEY TUCCI!